2011 Reprint of 1921 Edition. Full facsimile of the original edition, not reproduced with Optical Recognition Software. Andrew Murray is one of the most celebrated spiritual writers of his time. Many of his works have stood as spiritual standards for a hundred years. This book is a masterful illumination of the pages of the book of Hebrews. In every passage Murray sees the purpose of God in the New Covenant - to set His very Spirit within us. As one of Murray's earliest efforts, this book is something of a lost gem. It has been little published, and even less known. But the depth of heart and richness of spiritual revelation shine through these pages. Murray's keen insight brings us to the heart of God's intent in sending the Holy Spirit. 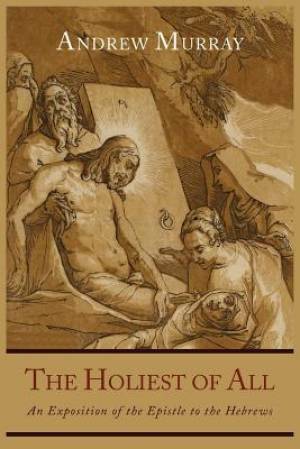 The Holiest of All: An Exposition of the Epistle to the Hebrews by Andrew Murray was published by Martino Fine Books in October 2011 and is our 6041st best seller. The ISBN for The Holiest of All: An Exposition of the Epistle to the Hebrews is 9781614271864. Be the first to review The Holiest of All: An Exposition of the Epistle to the Hebrews! Got a question? No problem! Just click here to ask us about The Holiest of All: An Exposition of the Epistle to the Hebrews.